Jimmy Wales, Founder of Wikipedia "I want to buy Snowden a beer"
Today Jimmy Wales, founder of Wikipedia spoke at the CeBIT. He had a lot to say about privacy concerns, the NSA scandal and Edward Snowden. When he was asked whether he thinks Snowden should be allowed to return home he responded “Yeah, and when he does I will buy him his first beer”. As you can see in the above image he brought up what Bill Gates had to say about Snowden. And while he expressed great respect for Bill Gates he does not agree with this, and it has got Jimmy to lose a lot of faith in Bill Gates. 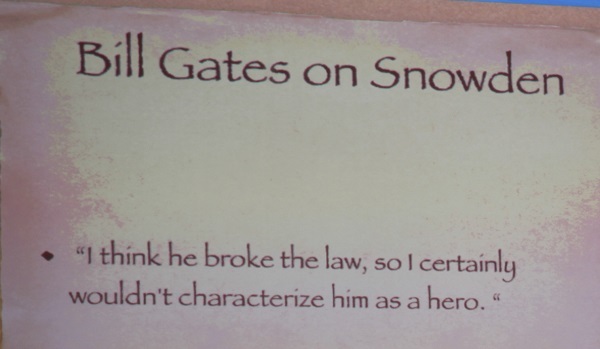 Personally I find it funny since Bill Gates is also a criminal if you look at it that way. At one instance Bill Gates actually got drunk and put a huge Internet Explorer logo made of wood in the fountain outside Netscapes office. I suppose that means that the success Bill had with Microsoft is somehow invalidated. In October 1997, Internet Explorer 4.0 was released. The release party in San Francisco featured a ten-foot-tall letter “e” logo. Netscape employees showing up to work the following morning found the giant logo on their front lawn, with a sign attached that read “From the IE team … We Love You”. The Netscape employees promptly knocked it over and set a giant figure of their Mozilla dinosaur mascot atop it, holding a sign reading “Netscape 72, Microsoft 18” representing the market distribution. Using Bill Gates logic Rosa Parks should have been punished for not sitting at the back of the bus. And also she accomplished nothing, because it was a crime. He hopes Obama will change his mind and compromise, but he seriously doubts it. When asked if he thinks Snowden should be granted asylum in Germany Jimmy literally responded “Oh that’d be cool” And everyone laughed and applauded. 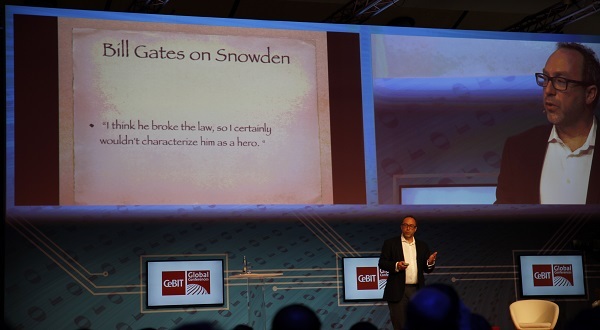 Jimmy Wales was not alone to stand up against the NSA at CeBIT, Steve Wozniak also expressed great dislike for the unconstitutional acts of the NSA. And how our freedom of speech is being greatly suppressed.